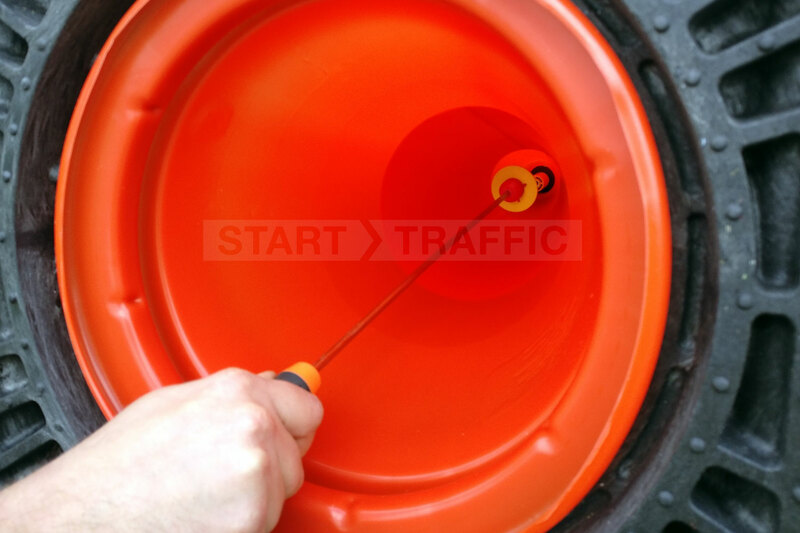 This compact traffic cone safety lamp is part of our wider range of traffic cone lights. It is designed to be compact, secure and easy to maintain. The batteries that are used in this lamp are standard AA batteries and are available to buy as an additional item. With a fresh set of batteries, the lamp will offer an extended 1500 Hours of visibility. The lamp has two operating modes which include a flashing setting and a constant mode. When set to flashing mode the battery life is 1500 hours, in the constant mode the lamp will illuminate for 750 hours. The lamp has a photocell incorporated within the housing that automatically shuts off the light during daylight hours and reactivates it automatically after sundown or in dark conditions. This lamp is unique as it is one of the only lamps on the market that fits into the top of the cone. For this reason, you will have to ensure that your chosen brand and model of traffic cones are compatible with the lamp. A simple disk is fixed to the underside of the lamp to lock it into place on the cone. This prevents it being removed, or “flying off” if the cone is hit by a vehicle. It will work with any other cone that has a hole greater than 33mm diameter in the top. Unlike many other lamps, this cone lamp gives a 360-degree warning to approaching traffic that there is a hazard in the road. This makes it ideal for use around junctions where traffic and pedestrians are approaching from all directions. Not looking for this cone lamp? All is not lost! We have a large range of lamps that can be viewed in our safety light category. Alternatively, you can call our sales team on 01905 794 875, they will happily assist you with any enquiries that you may have, ensuring you get the best product for your needs at the best price.